A group of Labour activists who helped shape party policy on Brexit at conference have penned an open letter to all Labour MPs asking those supportive of leaving the EU how they plan to fund the exit, LabourList can reveal. The letter, signed by 24 members who acted as conference delegates last year, begins by thanking those in the Parliamentary Labour Party who advocate holding a fresh EU referendum. But it goes on to express disappointment in having to “persuade” MPs, shadow cabinet members and the leadership to follow party policy, saying that the “experience really has shaken our faith in the party’s supposed member-led policy-making process”. The anti-Brexit activists then argue that any Labour MP who supports implementing the result of the 2016 referendum should be able to name the policies laid out in the last manifesto that they would be willing to scrap. Below is the full text of the letter sent by 2018 conference delegates to Labour MPs. Firstly, to the very many of you who have confirmed your support for party policy, a public vote on the Brexit deal, thank you. This is right for your constituents, the country and for the Labour Party. Having spent more than six hours in that historic compositing meeting at party conference last September, we are disappointed that the policy we eventually arrived at, which involved a great deal of compromise from us, is not being adhered to by every single Labour MP. We didn’t expect that, along with 1000s of Labour members up and down the country, we’d have to spend the next six months trying to persuade a significant number of our elected representatives, including the party leadership and many in the shadow cabinet, to follow the policy. This experience really has shaken our faith in the party’s supposed member-led policy-making process. It is saddening to say the least that we find ourselves expending huge amounts of energy and time trying to convince some Labour MPs to fight to defend the jobs and workers’ rights of their constituents; the NHS; the Good Friday Agreement; the future opportunities of young people; and the bedrock of peace and security across our continent for the last 70 years. Even if we didn’t have the Brexit policy in place, surely this is what we should expect every Labour MP to do? Brexit in any form cannot match in any way the benefits of full membership of the EU. The PM’s deal is predicted to cost the exchequer in the region of £24bn a year in lost revenue, equivalent to 6p on the basic rate of income tax and is merely one indicator of the way in which it will impoverish the nation. Labour’s ‘alternative plan’ also undermines freedom of movement and services and is thus estimated by economists to be equally damaging. Any Brexit will severely hamper a future Labour government’s plans to tackle the unacceptable inequalities in our country. The excellent policies laid out in the 2017 manifesto were costed at £48bn. Take away the £24bn in lost revenue and it is obvious very hard choices will have to be made. Furthermore, the post-Brexit economy is expected to be depressed, so a future Labour government will be stuck presiding over a depressing period that the Conservative media will label a failure – a recipe for a one-term administration. Labour MPs who still want to facilitate Brexit need to face up to the choices in front of us. 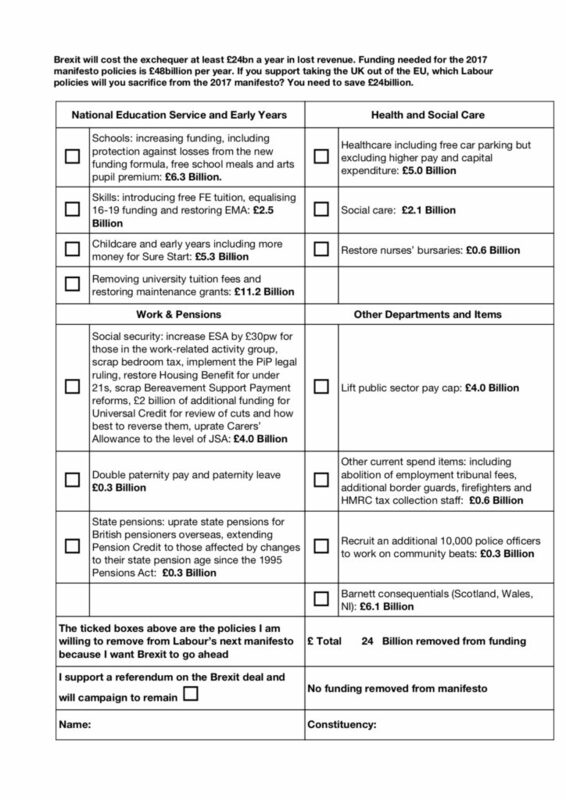 To highlight this stark reality, we have included a form with this letter that contains details of all the funding commitments set out in the 2017 manifesto. We would respectfully ask those still minded to enable Brexit to choose the policies you want to keep and those you are willing to sacrifice in exchange for leaving the EU. We believe it’s important that you are honest with voters about this. Meanwhile, those of you who already support a People’s Vote and would campaign to remain and reform the EU in such a vote can reassure your constituents that you don’t want to remove any of the spending earmarked to repair the damage done by years of Tory austerity from a future manifesto. Abandoning Labour policies desperately needed to improve the lives of people across this country, in order to make the dreams of Nigel Farage, Boris Johnson and Jacob Rees-Mogg come true, is not what any of us joined the Labour Party to do. Of course, we acknowledge and accept there is nothing simple or easy about Brexit. For MPs from areas that voted Leave the challenges are especially difficult. However, what is simple is that all Labour Party MPs should fight for the best interests of the many and not the few. That is what the wording and the spirit of our policy sets out to achieve and it’s overwhelmingly supported by members. Added to that, the majority of voters in every Labour seat want the chance to have their final say on Brexit. Trade union members quite rightly are given the chance to vote on any deal negotiated on their behalf – surely it’s only fair that voters are offered that same opportunity. We will be on the ‘Put it to the People’ march on Saturday and we hope you will all be joining us.